Each of the three games in the Spyro Reiginited Trilogy has their own set of Achievements/Trophies to earn, here are the ones for Spyro: Year of the Dragon. There's one achievement/trophy for each level and a second one for each homeworld, and please note that they can only be done in the level described. A lot of the achievements/trophies you'll just get in the process of completing each level but a few require very specific actions. None of these are missable but you may need to exit and re-enter a level to try again if you've defeated too many enemies in the wrong way or something like that. While you don't need to get 100% to get this Platinum trophy if you are trying to get that you will, along the way, earn almost every trophy. Out of all of them there's maybe one or two you might not do normally (an extra long glide and freezing a lot of enemies) and one that seems to be a bit temperamental whether it'll be awarded or not (shooting vultures). It'll cost you 300 Gems to free her from Moneybags' cage. There's exactly 300 gems in the Sunrise Spring homeworld so you can free her without even going to a single other level. Requires you to reach the Return Home portal in each of the five main levels of Sunrise Spring. The coward Rhynocs are the small ones that run away from you and do not attack. They are only found in the main section of the level, there are eleven total with none in Sheila's section or the skatepark. One of the very few Year of the Dragon trophies that requires some extra effort. First go to the upper area accessible by a small whirlwind that turns on after you have opened the Return Home portal, keep going to just past the first two flamethrowers and then jump and glide down towards the beginning of the level so you go past the tall whirlwind. You should have enough height to get the five seconds of air time in before you land. There are probably a few other places in the level where you can just about get enough time but this jump will definitely do it. And straight back to one you can't miss if you fully complete the level. The key is on the bottom ridge of the Return Home portal platform on a small bit jutting out by the lava, if you go on the wooden bride after the Return Home portal you can see it down on the left. The chest is on your left at the very start of the level. Swim through the top of the final area before you open the Return Home portal to reach the doorway to where you go fight Bluto. Shoot him when he pops up out of the water with the torpedoes you pick up from the floating crates. Pick up a bunch and then, when you get the opportunity to, fire them all as quickly as you can at him. If he pops out of the top of his sub and starts hitting it he's repairing it, you can put a stop to that by attacking him. Mostly just got to look for the high up caves where some of them are hiding. I don't know how you'd even come close to winning this race without doing this anyway. During the Race the Butterflies challenge along the path you'll see blue stars that you can fly through to boost your flying speed for a short time, there are five on each lap so even if you don't go for the ones that are slightly off the path you should easily get this. Yeah the trophy is to just beat him, there's no need to do it perfectly or without flaming any sheep or any extra kind of challenge whatsoever. The basic strategy for beating Buzz is to charge at him and knock him into the lava six times. The pattern changes every two bits of damage. To begin the fight you charge straight at him, keep walking towards him but watch where he lands when he side-jumps so you can then quickly charge at him again. If he starts running at you the bounce back might not be as good so just keep repeating that until he falls in the lava. Once he goes in run over to the far side of the arena and get ready to run to the side in an arc when he starts rolling towards you. Once he's done that repeat the first part again. After the second bit of damage he'll now produce a ring of fire around him when he lands after being charged so don't be too quick. Instead just slowly approach him and just wait for the fire ring to vanish before immediately charging into him. If you're finding that he reacts too quickly and you're only getting a tiny rebound then instead let him bounce you away (you don't take damage from that) and then quickly charge back at him and you'll get the full sized rebound. After two turns of that he'll add a triple burst flame breath attack after the fire ring which actually makes it easier as you now have plenty of time. Wait for the first two blasts and then jump and glide towards him over the third, charging at him while in the air. After you've beaten Buzz return to Sunrise Spring and talk to Zoe just outside of where the balloon is located to enter the first Sparx world. The Crawdad King is the extra large final enemy of the level that you need to defeat to open the portal out of there. Byrd costs 700 gems to free, you can find where Moneybags is keeping him by going directly straight forwards from where you enter Midday Gardens. As with the first world you need to reach the end of each of the main levels of Midday Gardens and then set off in the Whirligig for Evening Lake. On each cannon just look around for the ice blockages and blow them up. At the first cannon there are two (the main blockage and one on a whirlwind to the right), at the second cannon there are four (a whirlwind behind it and two caves in front with a second ice block in the cave on the right), and at the third cannon there are three more which are unnecessary for the trophy as you should already have it by that point. Four are necessary to reach the end of the level and there are five optional ones of which you only need to smash two. The four balloons are holding vases with gems in so you'll want to do this anyway. Rather than trying to hit them with the green lava balls just wait until you get to the Sgt. Byrd section to shoot them down using his rockets. Very simple mini-boss, charge his bombs back at him and flame the little creatures he sends out. He's found through a door around the back of where you open the Return Home portal. To open his door you first need to light the tea candles found around the level. It'll give you gems so again this is something you'll be doing anyway. Pick up the bombs to drop on the three otherwise unbreakable treasure chests. During the Race the Bi-planes challenge fly into the red stars to pick up a rocket and breath it out by using your flame breath. There are four to pick up on each lap so you can have this done early in the second lap. The last two are not on the best path but even if you skip them the other two are enough to get six shots off in the race. No Dragon for Lunch Today! Again no special requirements for this, just beat it. For his first two health points you need to charge the glowing orange balls at him, line yourself up and charge into it to bounce it off his head. You can avoid his singular ranged attack by moving to the side. After the two health points are taken Sgt. Byrd will start dropping in red ammunition, you will want to run over and grab it then run up to Spike and use your powered up fire breath on him. You can only hurt him once per go so don't stick around. Avoid his double shot attack and go for a second flame breath powerup attack. If Spike gets his hands on one of these be prepared to jump over the fire shockwave he sends out. For the third phase of the fight Sgt. 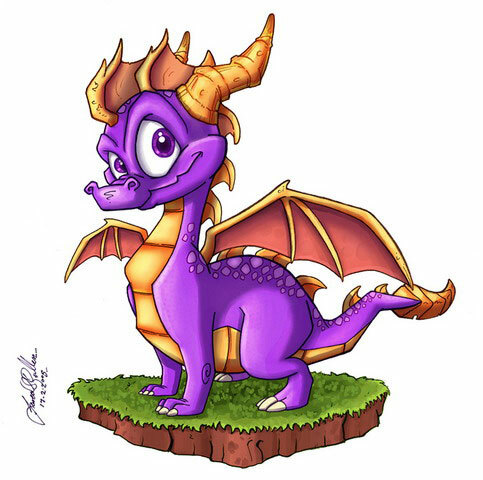 Byrd will start dropping purple ammunition, these fire a single purple ball at him when you try to use your fire breath. If he gets one though he'll start firing an electric beam attack that lasts quite a while, rather than just trying to go to the side charge sideways but also towards him to get behind him. A second purple powerup attack will finish him off. Return to Midday Gardens after defeating Spike, you have to have beaten the Sparx world in Sunrise Spring first as well. This guy will cost you 1000 of your gems, you can find him by swimming down into an opening in the central tower. For each level of Evening Lake reach the end. If this doesn't pop for you by the time you've got all of the gems then try the level again but make sure not to die or go into any of the sublevels before shooting them all. When shooting them keep in mind that you can sometimes see vultures from one cannon that you have to use a different cannon to actually hit. There are plenty of enemies in the level to use this on. This is the aim of the sublevel where you fly around with superflame shooting the long Chinese style dragons. Don't bother following them down the tunnels, instead try to cut them off as they come out the other end (but make sure not to fly directly into their heads or you'll likely get fireballed). Wait for one of the cat wizards to make an unarmoured enemy large before flaming it. There's one right near the start of the level. There's a treasure chest at the top of them so this is something you'll be doing anyway. During the race against the bumblebees you'll want to be flying through the blue stars to stand a chance of winning anyway. There are eight stars you can attempt to fly through on each lap so you can have this done halfway through the second lap. Same as the previous boss trophy, all you've got to do is defeat him. The general idea with this fight is to use the ammo that Bentley throws into the arena to shoot Spike while he moves to his next position. There aren't as distinct phases of the fight as other ones but generally Spike will start out throwing Crab eggs, after a bit of damage he'll switch to TNT Rats, then after some more he'll throw either Fire Goblins or a Buzz boss at you. You defeat Buzz the same way you fought him in his own fight except it's just stage one and he'll die the first time you bump him into lava. He'll also often throw out a burst of fireballs over where you're standing so watch the shadows to see where you can move to to avoid getting hit by them. While avoiding the fireballs and killing the smaller enemies you should also be firing green rockets or red bullets at Spike when he moves from position as he'll drop his shield as he does that. The green auto-tracks so you just have to pointing in his general direction but the red bullets need to be shot directly at him which can be difficult when he's moving so you're most likely to hit him when he stops, but as he brings his shield up quite quickly you'll want to start shooting before he stops moving. Return to Evening Lake and climb up the central tower after you've defeated Scorch and completed the Sparx level in Midday Gardens. He'll cost you 1300 Gems to free if you do it in the intended order. If you defeat the Sorceress without freeing him and then chase down Moneybags (which removes him from all of his locations in the game and automatically opens everything he would usually ask you to pay for) you will still get given this trophy so don't worry about that. After defeating the Sorceress you can find Moneybags on a bridge in Midnight Mountain. The big blue crystal bears, there aren't very many and just require a simple flame. Almost an actual thing to do but they're both by gems so it's not likely you wouldn't do it anyway. The first one is on the upper area just outside where you find Moneybags, and the second one is inside on a ledge you jump to from the top of the hole that leads to the underwater section. Use the lava rocks that the Earthshaper mummies try to throw at you. As the Sarcophagi drop gems you will, as usual, want to do that anyway. The ones in the Agent 9 section do not count for this. You'll probably just get this accidentally if you're not getting absolutely perfect shots. Just keep firing wildly and eventually one will bounce off a wall and hit an enemy during the sequence. The balloons are all up high so make sure to look up. He's waiting for you in the ground floor of the lighthouse. Once you've gathered 100 Dragon Eggs you can face off against the Sorceress (possible to do the moment you set foot in Midnight Mountain). The general idea here is to jump on the outlined cannons and vehicles and use them to shoot at the Sorceress while avoiding her attacks. Charge to the side to avoid her orange fireball attack, her blue electric ball attack is easier to avoid if you're moving slowly. And if she runs towards you just charge away from her. Be careful when charging to the side as the arena has no barriers to keep you out of the lava so you'll have to watch out for that yourself. While doing all that be on the lookout for the ghostly outline of a cannon, jump onto it and the Sorceress will start running away from the centre of the arena, it is at that point you should aim the cannon (it's generally set at the right height to hit her where she'll stop) and start trying to hit her. Once she stops you've got a second or two before she'll fire back at you and as you're in a stationary cannon you'll have to jump off to avoid it (if you run out of ammo you'll be thrown off it anyway). Between phases she will fire a ton of blue balls into the air for you to avoid, they don't have shadows so just move far away from where you were standing. After a few hits on her the drops will start to be cannons on wheels, these you'll have to drive after her to try and hit her as that makes it a little easier to hit but you could just stay quite far away and lead your shots well. A few more hits from that and you'll start getting a flying vehicle that can shoot. This one will let you stay on it as long as you like as it doesn't have limited ammo but be very careful when flying directly towards her as getting hit will knock you off it and the orange fireball attack will hit you if you wait too long to veer off. The easiest moment to hit is right away so if you're having trouble flying it just immediately shoot when you get on and then hop off to try again on another one. Once you've defeated The Sorceress and completed all the other Sparx levels you can enter this final Sparx world and gain Sparx's ultimate power.